I’m not delving into the details of setting up VPC Peering between our MongoDB Atlas cluster and AWS Lambda for 2 reasons: 1) we already have a detailed VPC Peering documentation page and a VPC Peering in Atlas post that I highly recommend and 2) M0 clusters (which I used to build that demo) don’t support VPC Peering. 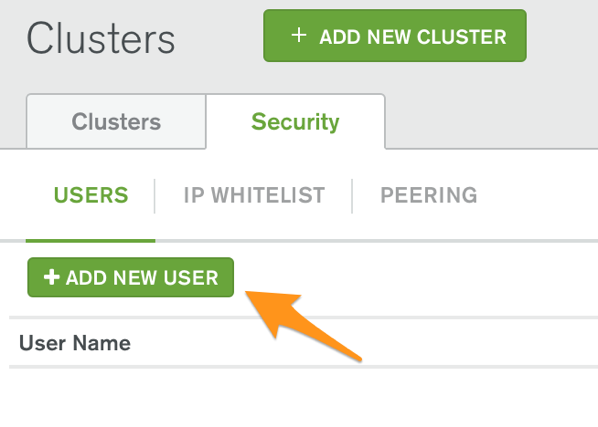 You will have to add the infamous 0.0.0.0/0 CIDR block to your MongoDB Atlas cluster IP Whitelist because you won’t know which IP address AWS Lambda is using to make calls to your Atlas database. If you’re only trying to get this demo code to write, these 2 caveats are probably fine, but if you’re planning to deploy a production-ready Lambda-Atlas integration, setting up VPC Peering is a security best practice we highly recommend. M0 is our current free offering; check out our MongoDB Atlas pricing page for the full range of available instance sizes. As a reminder, for development environments and low traffic websites, M0, M10 and M20 instance sizes should be fine. However, for production environments that support high traffic applications or large datasets, M30 or larger instances sizes are recommended. In the User Privileges section, select the link. This allows us to assign read/write on a specific database, not any database. In the Select Role dropdown list, select readWrite and fill out the Database field with the name of the database you’ll use to store documents. I have chosen to name it travel. In the Password section, use the Autogenerate Secure Password button (and make a note of the generated password) or set a password of your liking. Then press the Add User button to confirm this user creation. Additionally, if you aren’t using VPC Peering, navigate to the IP Whitelist tab and add the 0.0.0.0/0 CIDR block or press the Allow access from anywhere button. As a reminder, this setting is strongly NOT recommended for production use and potentially leaves your MongoDB Atlas cluster vulnerable to malicious attacks. 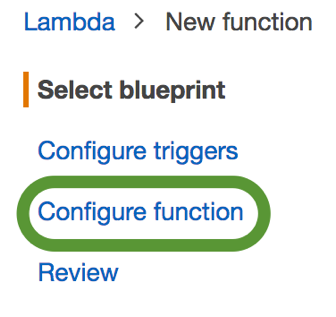 The file is written exactly as the Lambda code Amazon Web Services expects (e.g. with an “exports.handler” function). This is because we’re using lambda-local to test our lambda function locally, which conveniently lets us write our code exactly the way AWS Lambda expects it. More about this in a minute. Note also that we are declaring a cachedDb object OUTSIDE of the handler function. As the name suggests, it’s an object that we plan to cache for the duration of the underlying container AWS Lambda instantiates for our function. This allows us to save some precious milliseconds (and even seconds) to create a database connection between Lambda and MongoDB Atlas. For more information, please read my follow-up blog post on how to optimize Lambda performance with MongoDB Atlas. We are using an environment variable called MONGODB_ATLAS_CLUSTER_URI to pass the uri connection string of our Atlas database, mainly for security purposes: we obviously don’t want to hardcode this uri in our function code, along with very sensitive information such as the username and password we use. Since AWS Lambda supports environment variables since November 2016 (as the lambda-local NPM package does), we would be remiss not to use them. If you want to test it with your own cluster URI Connection String (as I’m sure you do), don’t forget to escape the double quotes, commas and ampersand characters in the E parameter, otherwise lambda-local will throw an error (you should also replace the $PASSWORD and $DATABASE keywords with your own values). You might also have noticed my performance optimization comments and the call to context.callbackWaitsForEmptyEventLoop = false. If you’re interested in understanding what they mean (and I think you should! 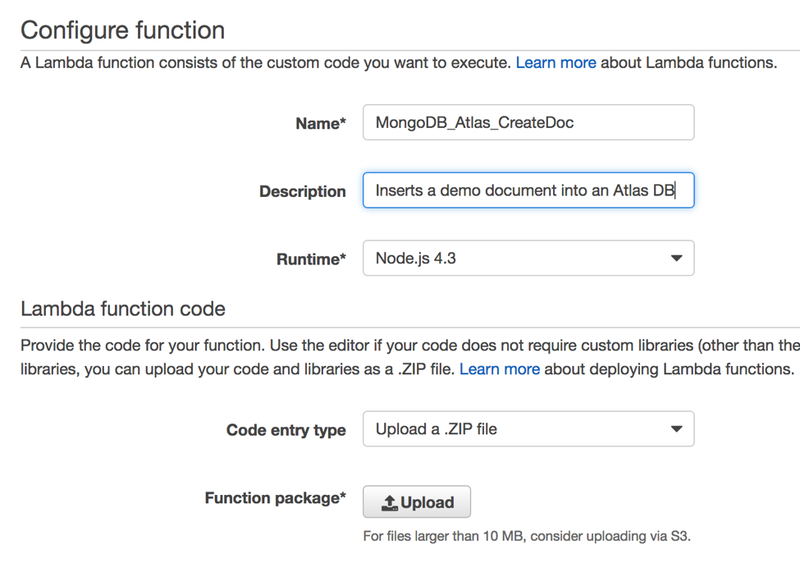 ), please refer to my follow-up blog post on how to optimize Lambda performance with MongoDB Atlas. The first step we’ll want to take is to zip our Node.js project, since we won’t write the Lambda code function in the Lambda code editor. Instead, we’ll choose the zip upload method to get our code pushed to AWS Lambda. Click on the Upload button and select the zipped Node.js project file you previously created. In the Advanced Settings section, you might want to increase the Timeout value to 5 or 10 seconds, but that’s always something you can adjust later on. Leave the VPC and KMS key fields to their default value (unless you want to use a VPC and/or a KMS key) and press Next. But do you remember our use of environment variables? Now is the time to configure them and use the AWS Key Management Service to secure them! At this point, you could press the Save and test button at the top of the page, but for additional (and recommended) security, we’ll encrypt that connection string. Scroll and press the Save and test button. Kudos! You can savor your success a few minutes before reading on. 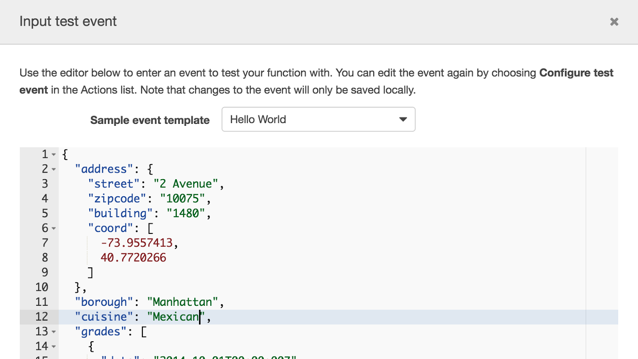 Learn how to visualize the data you created with your Lambda function, download MongoDB Compass and read Visualizing your data with MongoDB Compass to learn how to connect it to MongoDB Atlas. Planning to build a lot of Lambda functions? Learn how to orchestrate them with AWS Step Functions by reading our Integrating MongoDB Atlas, Twilio and AWS Simple Email Service with AWS Step Functions post. Learn how to integrate MongoDB and AWS Lambda in a more complex scenario, check out our more advanced blog post: Developing a Facebook Chatbot with AWS Lambda and MongoDB Atlas.